Have you ever stopped to think about how lucky we all are to be parents in 2011? Not just because DVD players are built into back seats or that iTunes offers a staggering selection of white-noise-for-baby songs (including vacuum! ), but because cooking for our children is overlapping with the here-to-stay movement of cooking simple, fresh, food. I don’t know about you, but when I first decided I was going to teach myself to cook, I was picturing fancy and dreaming big. The recipes I gravitated towards involved lots of steps and artery-clogging ingredients. 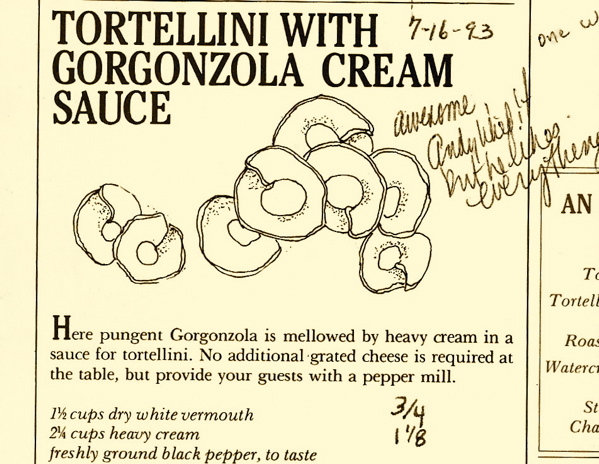 (I’m talking to you Silver Palate Tortellini with Gorgonzola Cream Sauce! *) Those were the meals that professional cooks made, right? I realize that Chez Panisse had been open for a full 20 years by that point in my life, but if you asked me who Alice Waters was when I was 22, there’s a 100% chance I would have told you she was the author of The Color Purple. 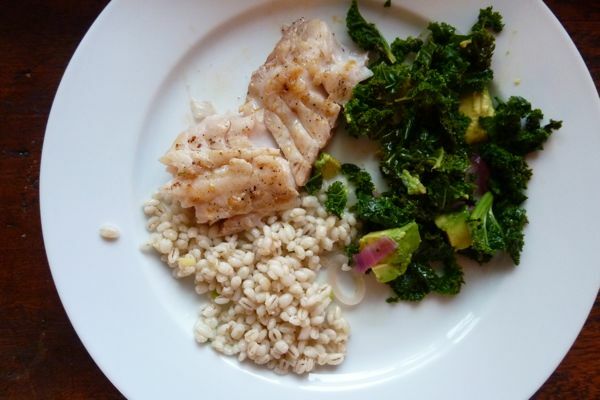 The point is, we are so lucky that simple food equals good food, and that you can brush a little smoked paprika butter* on a piece of just-off-the-boat super-mild tilefish and have a sophisticated dinner that doesn’t necessarily alienate the kids. And that’s just what we did last weekend. **Yes, I debuted it for Andy on July 16, 1993 and took notes. *I loved every page of Blood, Bones, and Butter, but I think every page I dogeared mentioned smoked-paprika butter. You can find smoked paprika in the spice section of most ethnic markets or at Penzeys.com. 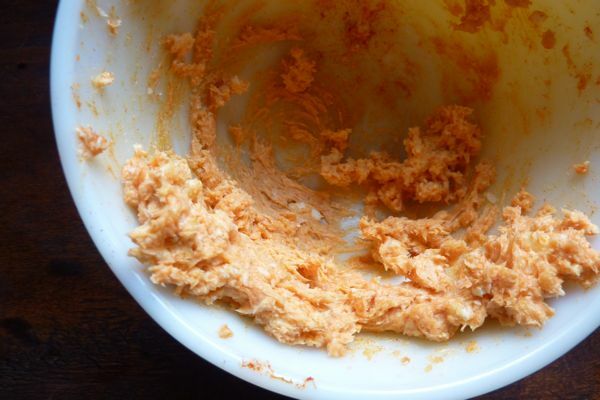 To make the smoked paprika butter: Beat together 1/4 cup unsalted butter (1/2 stick) with 1 tablespoon smoked paprika and a large pinch of kosher or sea salt until it’s blended together. 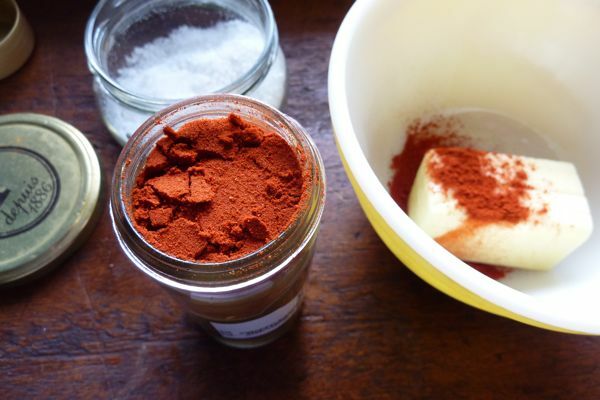 In a small saucepan over low heat, melt your smoked paprika butter and pour into a heatproof bowl. This is the second Sunday in a row that we’ve started off on a healthy note and I’m hoping to keep it up through summer. The formula is pretty simple: grilled seafood + healthy grain + anything with kale. Prepare Your Grill. 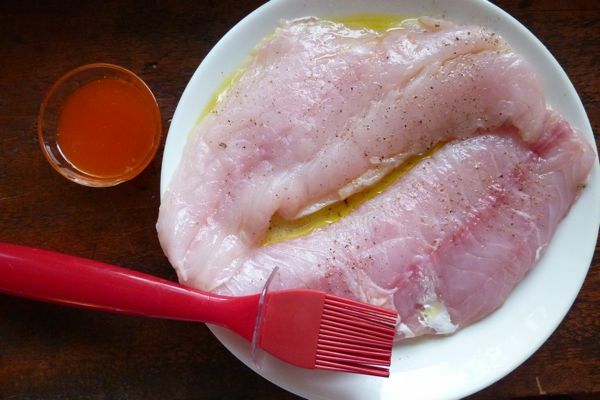 Marinate a 1-pound piece of firm white fish (such as tilefish, swordfish, mahi mahi) in a little olive oil, salt, pepper, and a squeeze of lemon. (Add the lemon only about five minutes before you grill.) Once grill is hot, grill filet about 4-5 minutes a side depending on thickness brushing smoked paprika butter as you go. (Fish is done when it’s firm to the touch with out being rock hard.) Remove fish from grill and brush one more time with butter. Serve with braised kale salad and herby barley salad (simple!) below. Bring 1 cup pearl barley, (rinsed and picked over), a teaspoon salt, and 3 cups of water to a boil in a medium pot. Cover and simmer for 50 minutes until barley is firm but cooked through. Toss with a few tablespoons chopped herbs (I used parsely, thyme), olive oil, salt, pepper, chopped scallions, and a squeeze of lemon (or tablespoon of white balsamic vinegar). I loved smoked paprika these days, I’m putting it on *everything* including plain nonfat yogurt for breakfast! Sorry to be a pest, but how did you make the kale salad? Is that red onion and avocado? Delicious! And did you do a dance like I did in the vegetable aisle of Trader Joe’s when they started selling bagged kale? I did a jig right there among the bagged salads! I love a good fish recipe, because this is an area where I need definitely need inspiration. Never a pest! Click on the link in the fish recipe for “braised kale salad” — instructions should be in that post from a few months ago. Huge fave around here. Jeez, I did not see the link the first time I read it. Sorry about that! More coffee, less chatting! Jenny – if you’re looking for more easy kale recipes, I highly recommend this one, which brings kale and quinoa together in one pot. So good, and good for you (pipe down, goat cheese)! I just bought a tin of paprika for some goulash I was making. What to do with the rest of it? Butter! Ah, brilliant. I have looked EVERYWHERE to try and find smoked paprika….so many recipes i want to do call for it! Where do you find yours? I love that you take notes. My mom always did it — commenting on weather, attitudes and activities. Reading her old cookbooks is like reading a diary. I had to comment b/c back in 1989, as an undergrad, I made that exact artery-clogging dinner for 2 college professors in my dept. I invited them, and a friend, and we thought we were the freaking height of culinary sophistication. Thanks for the memory, and for an excellent web site. Cory – I love that story. I thought so too! So true about simple food today. I just bought that book and am looking forward to reading it after I finish A Year With Fannie Farmer – talk about complicated cooking! The page from Silver Palate cookbook took me back – my “go-to” book in the early days of marriage in late 80s. It’s still on my shelf (albeit in the basement vs. prime real estate in the kitchen) and used occasionally for tried and true recipes -love the butterflied leg of lamb on the grill and Oatmeal Lace cookies! Can’t bring myself to make the “artery cloggers” anymore. Love your blog! And as with most fish these days, if you care about seafood sustainability you need to be careful about which regions your tilefish, swordfish, and mahi mahi come from and how they were fished — not all the fisheries for these species are well-managed or in good shape. More info on that from EDF (http://www.edf.org/page.cfm?tagID=1540) or Monterey Bay Aquarium’s Seafood Watch (http://www.seafoodwatch.org/). Laughing because that was my first married cookbook. At just 21, I pored over its pages, admiring the line drawings and fantasizing about the fabulous dinner parties I would soon host serving those dreamy, fancy recipes. Twenty-three years later, I entertain friends on a weekly basis, and even though I don’t make many dishes from SP, I credit it with inspiring my interest in cooking and entertaining! I actually laughed out loud at “but if you asked me who Alice Waters was when I was 22, there’s a 100% chance I would have told you she was the author of The Color Purple.” And, to be honest, paprika butter would have been a page turner for me before this post. I feel slightly foolish to realize that it is simply butter with paprika. I’m telling you, I can overcomplicate/scare myself out of most recipes. This is why I am thankful for you guys! Quick question on this recipe – we lead a sadly grill-less life in a small Brooklyn apartment. If we wanted to attempt this, would you recommend baking, broiling, or pan frying (what would be the easiest way to brush the paprika butter on)? Thanks – can’t wait to try it!